Do you cringe at the thought of having to replace your enterprise software solution? Does it seem like a monumental undertaking, with a high risk of failure? Knowledge is power. Learn from the experiences of other distributors who have been through the ERP selection process and not only lived to tell about it, but brought great benefit to their companies. 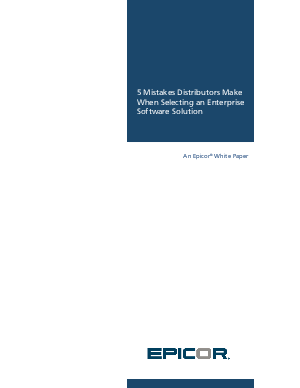 Read this white paper now and learn what NOT to do when evaluating ERP solutions for distributors.